I love the keys they are storey tellers. Already a follower and in love with th linens of course!! I am already a follower of your site. I would love the linens! I follow already and this is the best giveaway ever....all those lovely linens and the basket!! such a fab. giveaway! What an exciting giveaway. 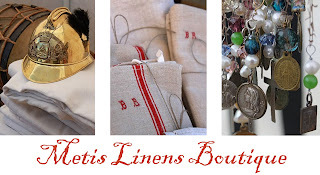 I am already a follower here on your lovely blog and have been following Metis Linens since they started as well. My fingers are crossed! What a great giveaway!! Yep am a follower. The first thing that I saw I loved and that was the gold military helmet!! Loving the embroidered napkins also! love it all, but the linen towels are my favorite!! Wow, wow and WOW what a great giveaway. I'm a follower and would love that fabulous gift... I'm swooning at the thought! Fantastic giveaway! I was already a follower. What I love most is the lacey Mister Darcy chemise! Gorgeous! Also the homme portrait is beautiful. How could you not follow, as far as a favorite I popped over and checked it out, It was all so wonderful, they are going to be a success! I am already a follower, and I loved their site. I love linens so will be back. Brooke featured them in a lovely post too so between your two, they are getting a fine introduction. Put my name in the hat, Karena! I've been following your site for awhile now and just love it! On the Metis Linens site, I think I like the religious charms the best! I'm following, count me in! I love the baubles with the medals and the stones, beautiful! What an AMAZING giveaway! I'm a follower, please enter me! What a wonderful giveaway!! I am a follower! Thank you for telling me about this! I love the atyle and beauty of it all!!! I think the hemp would make great place mates. Oh and I'm a follower ya know. I love reading your blog (as well as your comments on others). This is a wonderful give away - who doesn't love lavender and linens. I am always looking for new sources and inspiration to add a little more French to my home. Just recently became a follower...glad to be able to say so, in that this promotion wasn't the reason for my appearance here. Still I would be ever so grateful to win...and November is my Birthday month (lol). Continued success to you! Mais qui. What a beautiful blog, I now follow your blog. Great giveaway! I love it all but I LOVE the linens the best! Everything looks so beautiful! I'm already a follower, and this is a great giveaway! Hope you meant this: to do a second comment (for another chance) and indicate which product I like best... Actually, the dried lavender is lovely in that very artisinal container. I'm a follower and what a lovely giveaway! I love the religious medal wraps they have on their website-how unique and beautiful! I follow and I love mattress ticking! Wow Karena...you topped your self on this one, and that's really saying something. Those religious medals are beautiful! What a beautiful and generous giveaway. Those religious medals with the beads are amazing. And I don't think I could be unhappy with any of those bags. Thanks for sharing; count me in! What a great giveaway. I am a follower of your blog. Just visited Metis Linens, the lavender is beautiful and the keys - and the excitement about this new venture! I have been a follower of Metis Linens for about a week now. love everything about it. I adore french linens. Oh please enter me in the giveaway. It is fantastic. I would just be in heaven if I won it. The keys are beautiful. For that matter, everything in the tote is to die for. Been following Andrea for awhile now, love her posts and baskets! Now I'm a follower and can't wait for your posts! I am a follower and I love all the products Metis are offering but the linens are my absolute favourite. I really appreciate the information they include about monogrammes and so on so you understand the product history too. You probably cannot do this for international followers but the basket and its contents would be so loved in Australia where they are so much harder to find. Thank you for your offer and for the beauty you all bring. I just became a follower! Love the look of your blog. Very serene. Andi love metis Linens! There are too many things to choose from at Metis Linens. Gotta say I love the wide ribbon and the keys though. Where to put them in the home? I'll figure something out. I became a follower. I love the linen, the lavender and the keys, in fact I love the total look. I LOVE the embroidery on the linens! I'm a new follower. Wish me luck! to follow : ) ! Love your idea and all your products! Going to be a follower. What I like about Metis is Laura! What a generous giveaway!! I would love to enter. I am a follower and my absolute favorite thing at Metis Linens is the red striped hemp and linen napkins. They're so beautiful. I wish Andrea and Laura much success with their new venture!! The linen towels and keys are my favorites! What a LOVELY giveaway!!! Bonne Chance to everyone! What an incredibly lovely giveaway! The Eze basket is my favorite ~ reminds me of one of our most beloved cities in the South of France! Such a beautiful basket of goodies.......Their hand towels are exquisite....Have a very happy weekend, xv. love the keys. happy weekend! You have a beautiful blog! I am a new follower~ ANd I was over at Matis site~ oh, what is not to love. Linens, keys, lavender,beeswax candles. All things that make a girl's heart sing! ANd that basket... a real treasure. Beautiful. Please enter me in the giveaway! Great giveaway! I follow, of course. Love all the medallions. Oh wow!! what a generous and glamorous giveaway this is! pick me! I am a follower. I love the linen dish towels. They are so cute, and with the red, ( I love red, anything red, its my favorite color): I also love the brooches. Can't get enough of them. I am a collector of brooches. Enter me in the giveaway. Ps. I love the basket, I guess I love it all. I'm a follower and I absolutely adore the "Mister Bennett Shirt" - absolutely gorgeous piece! Also love the kitchen linens. Love everything about this basket and it's contents!! already a follower and loving those linens! thanks for visiting my site Karena! Metis Linens products are of such good quality that they last forever. I subscribe to both websites by way of RSS. Ohmigosh! LOVE it ALL! Have become a follower and will definitely be a frequent visitor! Wow! It might be easier to pick one thing I DON'T love instead of just one I do! I think my favorite thing would be the men's linen shirt you detailed. Wonderful! I also love the beeswax candles with ribbons and charms, all the lovely linen and hemp linens, and and and and....the baskets and the lavendar and all the delightful little touches and make it all so lovely. Wow! SO wish I could visit that booth! I am torn between those great candles and the fab linens as favorites! Keeping my fingers crossed ..
ooh. And they're going to be at Rose Bowl in Nov. Bummed that I missed them last weekend. Just joined and became a follower. Everything on the site is beautiful, but I love anything monogrammed. The hemp and linens that are monogrammed are the best. Thanks, I hope I win!!!! I of course follow this blog here and on Facebook. As for the French Linens they are to Die for!! French Linens & antique keys..........simply heavenly!!! I'm a follower and what a great giveaway-I love it all-but especially the linens-thanks for the chance! I'm following, count me in! I love the candles with the medals and the gems, so beautiful! Its nice to see a company recycle with such a graceful touch! Love all the items especially the antique tea towels and the keys. Definitely a follower of both you and Metis Linens, Karena-what a fantastic basket. The linens, the medals, the keys, the basket-and we are supposed to choose just one?!!! Would have to go with the linens I suppose..thanks for the opportunity to win. The linen dishtowels are beautiful, but so is that market basket! And, being a sabre man, I can't resist the fencing masks and antique foils. A well-dressed and stylish boutique. New follower. Glad I found this site. Some very cool stuff. My wife and I are big fans of all thing French. I love the bag with the lambskin trim. I know my wife would love the Lavender bath salts. I forgot to tell you that I will also be posting a giveaway on my site next month. All are welcome to come over and check it out. Karena, thanks so much for letting me know about this wonderful giveaway! I'm a happy follower, and adore their antique linens...so pretty! Hi Karena! Already a follower and love the antique dish towels. Love the new partnership--well done. I love the linens with the red embroidery. Thanks for posting and thanks for offering the giveaway. And, yes, I'm a follower. Love your art! I really liked the rosaries and french medal along with the antique towels. Thanks! This is an incredible collection! Best of luck to the lucky winner! Hi Karena! I'm a follower now! Love the Metis site, the creativity in displaying everything at the show was great, loved the medals and rosaries pinned to the pillow, loved the blue ticking pillows...gorgeous site! I am a follower and just adore the photographs over at metis linens. The way they display items is also so refreshing! I am a follower and just love the keys. I am one of your current followers. Such a lovely giveaway! The entire site is a feast for my eyes. I really like the bunch of keys, and their patina. wow...what an unbelievable generous giveaway! wonder who the lucky winner shall be! This is great. Congratulations on this new journey. Wishing you all the best, the fabrics look fantastic. I've been a follower for a long, long time my dear. It's a reflection of my exquisite taste. 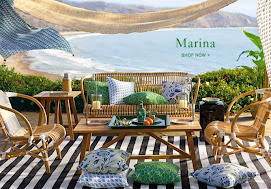 What is not to like at Metis Linens? The collection -- and the presentation -- is perfectly French in every way. Each item is an object of desire. How about I put you on my "favorites" list? Your blog is stunning and a beautiful escape. And oh my, how I love the French Medal jewels! i love everything linens... it's just nice to own a nice set of any of these beautiful fabrics! So strange - I thought I was already a follower, Karena! Well, now I am for sure. What a lovely basket of goodies. what can I say? I just love those red and cream linens. my absolute favorite! I am now a follower! Love your blog,BTW. Thanks for visiting Shadows On Stone, Karena. The textiles are beautiful, tho' I'd pick the keys, but if I win the basket, both would be enjoyed. You bet I am in for this one, everything Andrea does is so gifted. Yes, I am now a follower (whick I have been meaning to do). Happy weekend. This is one of the best giveaways I've seen and you always have the best Karena! I love the ribbon and charm bracelets - beautiful! WOW! And I thought the champagne giveaway was good. This is amazing! I follow your lovely blog and I love the red and natural linen dish towels from Paris Flea! Hi Karena, I'm already a follower! Love the French medals. Beautiful things! I love the towels with red embroidered monograms, particularly the really rustic-looking cross-stitched ones. I know exactly what I'd do with a gift basket this gorgeous - keep it exactly as it is forever! I could never bear to take it apart! I LOVED the keys.... Perfect....and I so enjoyed seeing your painted dropcloth too. Congrats on your new journey. I'll come visit often. I forgot to mention what a fabulous and generous giveaway this is.... OH MY! I am a follower for a while now! And what a lovely give away! I would so love to win this basket full of wonderful things! At Metis I loved the hemp linen. I can see that my excitement for this giveaway is in great company-- I too am a fan of the linens and napkins. Am a follower with great interest, thank you for stopping by and letting me know about your giveaway, I have been swamped with getting settled into our new home so have been amis with blogging. Mon Dieu Karena you weren't kidding! What a lovely Giveaway, and I adore all of their items...the keys, the linens, the medals, the rosaries, the lavender, the metis...well, you get the picture! I am a follower of yours :). Such a lovely gift offering, merging the best of old and new, with a modern twist! So pretty. Oh my goodness Karena! This is a fabulous give away! All those comments show that everyone is interested in it! So am I!I love everything on that shop! Have a wonderful Sunday Karena! thankyou for your lovely comment on my photo!! i'm following now, this giveaway is so generous!! How exciting! I love, love, love antique linens. Beeswax candles are so luxurious too. Dear Karena, I love the site! Love the grainsack fabrics with the stripes. I may have to get a couple for my shop. Please let me know how I go about getting them. Thanks for dropping by. I follow already and love your giveaway. I love the linens! I'm in! I am a new follower! So many beautiful things, so hard to pick just one. I adore it all...just drooling and crossing my fingers and toes! Absolutely love the vintage quality of Metis Linens!! I hope I win. What a lovely giveaway! As a personal collector of vintage linens for my own use, I loved the French linens, bien sur. This is a lovely package and I hope that I will win this nice basket and that you will consider following my Paris blog. Added you to my google reader! Those keys are scrumptious. I like to think that some day, long long ago- a very chic French woman lost her keys in the same manner that mine go missing every morning. Have been an unofficial follower for some time but am now official. Love all 3 sites. Absolutely adore the giveway. Sadly even though I am much closer to France (Scotland), I cannot find any beautiful linens like these any where at all. Needless to say would love to be entered into the draw and fingers crossed. Would be more than happy to pay the shipping costs. I love the old antique keys. They'd look great framed in shadow boxes. This is such a lovely and generous giveaway! I am a new follower and love the hemp/linen towels, they are tres charmant! I'm already a follower. :0) Lovely post. Thanks for visiting me at CasualLovesElegance. I appreciate the sweet comments very much! I love everything! Especially the blue and white ticking and the monogrammed linens and of course Andrea's French baskets! She came to do my "Olivenhain Grove Sale" this spring she is delightful! Thanks for including me, this is my first giveaway! Hi Karena, I love the hemp/linen towels at Metis. What a beautiful and generous giveaway! Also, I am a follower. Delightful basket of wonderful things. Thank you for enriching us in this way. What an amazing giveaway. My wish list just keeps growing. Everything is so delicious! Love the keys and the linens look to die for! thanks for such a wonderful giveaway! oops! forgot to say that I just became a follower! thanks again! Beautiful towels (the linen hemp) I love them! An incredibly wonderful giveaway! Their site is fantastic. I love the medals & jewels, the religious symbols and of course, the red striped hemp towels. Great giveaway, Karena! I love any of those linen fabrics, what is not to love about those. I don't Follow anyone, so that may not make me eligible. It's just not a tool I use. Thanks! Thank you for stopping by my blog this morning and leaving your sweet comment. Those linens are beautiful!! I am now a follower. Just became a follower! SO many beautiful things to choose from. I'm loving the linens! I am a follower. Beautiful blog! I love Metis Linens! I've been a follower of Decor to Adore for awhile and am so excited for both of you as you launch your new business! I'm now a follower of your blog and I think the best think about your Metis Linen blog is the abundance of great pictures showing all your lovely goodies! I just love love love Metis Linens. Your giveaway = amazing & generous!!! Yes I am a new follower! already a devoted follower. I had a minor kitchen fire, my first(and last) attempt at deep frying in a NYC tiny kitchen. I could use everything in that basket, including the basket. Thanks for letting me know about your fabulous giveaway and your blog! I am a new follower. Loved visiting the Metis site - such an old world feeling. Karena, I just became a follower! I love the vintage religious medals! Thanks for commenting on my blog, I appreciate your readership! hard to say what i love most over there, maybe her red ballet flats! but seriously the linen dishtowels were gorgeous, everything really. ps ~ i'm already a follower! The linens and the keys are my favorite. Of course, my motto is "the key to your decorating needs" so I'm in love with the keys!!!! Good French linens add so much character to a bathroom, kitchen or guest room, especially ones with embroidery. From the site, I especially love the kitchen linens (with the red stripe). oooolala! Lovely! I so enjoy when someone comments on my blog and it leads me to their beautiful blogs! I can't wait to explore yours further. I will follow along now! I am now a follower! Everything is so gorgeous. I love the linen towels with red trim. They are so perfect. Thanks for hosting such a great giveaway! Fabulous giveaway basket, wow!! I love all of the monogrammed linens. Hi. Thanks for visiting my blog. I would love to enter your giveaway. Didn't see alot on their site. I am a follower of Metis but waiting to see more. Absolutely love this basket and the goodies! Thanks for the generous giveaway! I am your new follower. Love it - I would love some of thoses linens - they are beautiful!!! Thank you for visiting my site. Now I have enjoyed looking at yours - and what's not to adore about French monogrammed linen! 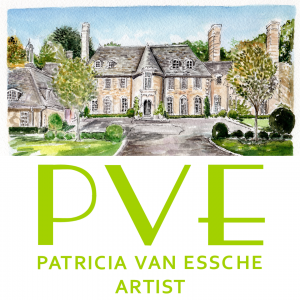 You might like to take a look at the Janet Haigh her work blog. She is a fellow artist working in fabric and metal and did a posting 'enameling skies' in August which I think you would relate to. Well, that was a long line to get to the back. However, I follow you around in the comment world, so I think of you about 50 times a day. I appreciate your visits to me, so I am pushing the pause button and taking a peek, and vote for mattress ticking. I know I follow you. Newest follower! I'm loving going through your posts! Newest follower of Metis as well! Love love the linens! Love those fencing masks! I am a follower! Love the linens...beautiful. I'll definitely follow! I loved the coins, keys, and the linen towels with red stipes! I wish you gals all the luck in the world! Great things, my favorite would have to be the sheets. thanks for letting me know about your wonderful give away, please throw my name in the hat. Wow! What a wonderful giveaway! I love everything from Metis! Thank you for stopping by Karena! Following! Love the keys, the linen/hemp dish towels.. so pretty! what a great giveaway! I love the linen and hemp dishtowels. I'm also loving the religious medals. Karena I think every beautiful thing ever invented is on this site. It's a feast for the eyes! Wow! I would have been so sad if I had missed this incredible opportunity...thanks for letting me know about it. So, I follow and I just got back from Metis Linens and I love everything you guys have. Of course, I love monograms, and all of the wonderful French linens. They are delicious. Love the basketful of goodies too! Such a beautiful giveaway! I happily became a follower, and I'd have to say that the linen dishtowels are what are the most attractive to me from the Metis Linens website. Ahem. I'll take one of 'Paxton' and one rosary. Please. As well, please send the whole darn prize to Canada....I love it! I need it! This business is going to explode with success! I've been following your comments all over our little blog land all afternoon, so I just stopped in to say hello again. My heavens, the comments, but it is a royal give away. I love the cheery red stripe on the linen that says"I am french".Im now a new follower. am now a follower - thanks for stopping by my blog, too! love the laces and linens...the metals, combinations of the all. HOLY Cow! 195 comments?? That's thru the roof!!? What I love on their site? The christmas bells... jingle all the way! I too became a follower! I love the monogrammed linen!!!! I don't mind at all paying for shipping, what a wonderful giveaway!!!! What gorgeous linens! It is all beautiful!